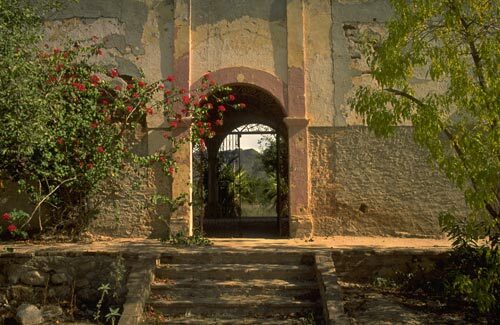 This is Casa Esmeralda, 1992, beautiful in its own overgrowth, painting peeling, walls cracking, ceilings missing way of being. One sensed she was a former beauty queen, posing outside of town to the northwest, halfway between today’s airport terminal and yesterday’s cathedral. She is waiting for a new adventurer – owner to arrive and serenade her, woo her back to a place she once was, a courtship repeated several times through the years. Through it all, the inclement weather, man’s unending skirmishes, El Camino Real’s dust and accumulated wear and tear from all those she gave shelter to, she is still here. 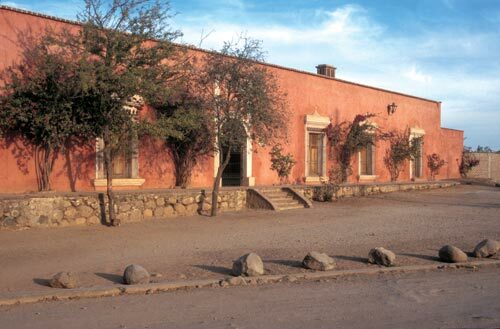 Less than fours years have passed in the long life of Casa Esmeralda. 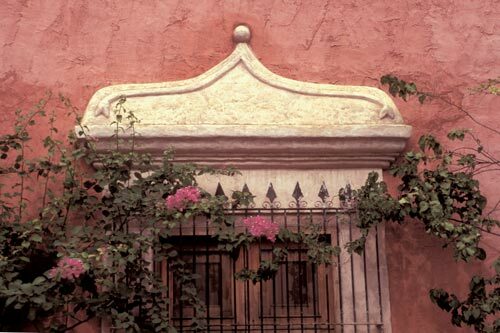 Oh my, spring 1996 and Casa Esmeralda is looking good with a youthful patina and structural glow. On close inspection, dignified, and understated, workmanship confidently announces itself complete. A transition has taken place. A new direction, anchored in the past, steps boldly into the future. History repeats itself. Are these walls that could tell stories? Centro Álamos is a short distance down the road to the right. When in Álamos all roads seem to meet at Plaza de los Armas. The airport, and road to travel north, are to the left. From here, one could begin a journey to anywhere on planet earth. Conviction, or lack of, is always evident in the details. Here, time is frozen in classical design and a master’s hands. This window looks out on a well-trafficked road and listens to sounds that are hundreds of years old. Today and Yesterday face the future together. Casa Esmeralda is somewhere in this view from Guadalupe Hill. Loma de Guadalupe sits in the middle of Alamos, and the barrios, that are south of the new road to Navajoa. Casa Esmeralda can be seen on the right-hand side of Calle Hildago which cuts diagonally across the photo on its way to the airport. 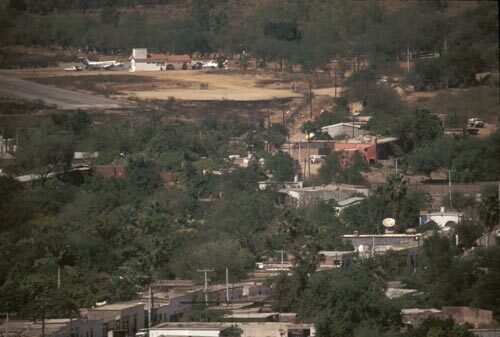 Guadalupe Hill is historic ground with encompassing views of Alamos. It is where the jail was, or is, I am not aware of its present location, all I know is that this is prime real estate. At the time of this photo there were 27 men and one woman incarcerated. 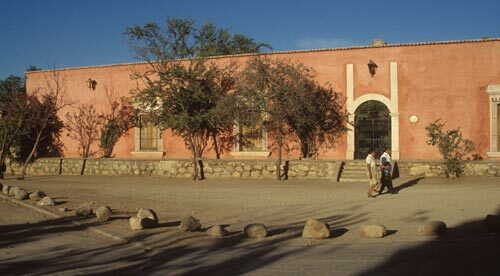 In the past, there were up to 75 prisoners lodged behind jail walls, with no view, on top of Loma de Guadalupe. This is the introduction to a film that was shot over the 1993 winter holidays in Álamos. This is a glorious season for the town. 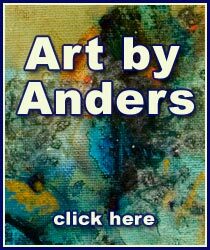 We start out at the airport and head east into town and visit the Alameda lined with stores and professional offices.